Congratulations to our latest WomensNet.net Amber Grant Winner, Meg McCall. Meg is the Founder of Angle Oar. 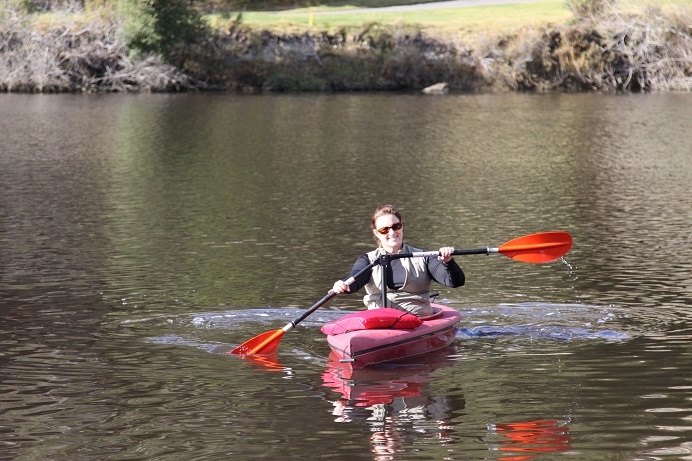 Together with her father, she aims to bring the joy of kayaking to thousands of new enthusiasts, and get those who thought they had to give it up due to injury, ability or age, a chance to get back out there. Continue reading to learn about what makes the Angle Oar unique. And be sure to check out the Angle Oar demo. WN: Congratulations on winning the February Amber Grant! MM: Thank you so much for this grant. It is tremendously helpful!! WN: How did your dad decide to become a kayaker in his 80s? There must be a story behind it! MM: Our family, and my Dad in particular, have always loved the outdoors. My sister older sister, Amy, had bought a kayak, and when my Dad saw it, he decided to give it a try, also. He’d always loved to boat and fish, and so at 75 he started fishing from his new kayak. Unfortunately, my Dad has several serious medical conditions including congestive heart failure, diabetes, asthma and poor circulation, just to name a few. So when he would go out using a traditional straight paddle, it wore him out very easily. That’s when he decided there must be a more energy-efficient way to paddle. He subsequently created the Angle Oar. WN: How long did it take for the design phase of the product? MM: He crafted his first prototype several years ago, but it wasn’t until I took a keen interest in it around November of 2012 that we began fine-tuning the design in earnest. We made a variety of improvements and tested several prototypes before applying for a patent in March of 2013. After that phase, I had to have the electronic drawings created and new prototypes manufactured based on our latest specs. We’re just now at a point where we’re doing our first large-scale run of paddles. So in total, it took about a year and a half from idea to manufacture. There have been many bumps along the way, but I always keep in mind the words I received in an unsolicited testimonial from a young woman who has a health condition that affects her shoulders and overall strength. She said, “I’ve been all over the Internet for months looking for a product like this. Please, keep developing your product no matter the trials you may come across. It will impact so many people.” That keeps me going! WN: What was your previous experience in marketing? MM: The first 14 years of my career were spent working for a United Way in Madison, Wi. I started out in the program evaluation and funding side of the organization, but for the last six years was the Director of Marketing. After that, I spent five years as a Marketing Manager in the IT division of the University of Wisconsin – Madison. It was there that I gained a deeper understanding of software and technology. This experience laid the groundwork for my last position as Director of Marketing for MINDBODY, which is based in San Luis Obispo, CA. The company provides business management software to health and wellness studios across the world. It was a very exciting and dynamic place to work, and my efforts helped the organization grow 70% for three consecutive years. The company is about to go public in another year or so. With respect to Angle Oar, my marketing experience has definitely been an asset. It’s been the manufacturing side of the business that has been the real learning curve. I continue to learn more about things like aluminum extrusion, plastic injection moldings and machine tooling each day! WN: Are your plans to sell it exclusively online to start? MM: Yes, right now we sell primarily online through our website and Amazon, however we have just begun reaching out to distributors and retailers, so the Angle Oar should be available in various retail spots by the end of the year. We also have another online distributor confirmed, Access to Recreation, that provides equipment and devices to people with disabilities, though the company is transitioning to a new website so our product is not up quite yet. On a related note, we give away a free paddle on our Facebook page at every major milestone. Everyone who Likes us is eligible to win. *Thanks for reading, and have a wonderful day. Remember that we’ll award another Amber Grant in March!